I knew it was going to be windy, and I expected the flight home from Edinburgh to be a bit bumpy, but the captain’s announcement that City Airport was shut was not what I wanted to hear. Especially as we were pretty much in the air over my house at the time. Worse, all of the alternative airports were full of diverted flights. When the captain mentioned Manchester and Leeds, I knew it was game over. The only airport able to take us was…you guessed it, Edinburgh. It was like those scenes in Lost where people try to leave the island, only to find themselves back at the island. To compound matters, my colleagues bagged the last two rooms in the decent hotel, consigning me to the one I didn’t like that has a view of the office. I wasn’t hopeful, it being Valentine’s night, but they did actually have some rooms – a manky twin on the ground floor overlooking the bins. I sat in the room, reflecting on the fact it had taken me 5 hours and 650+ miles of travel to cross the street. Unusually, for these Edinburgh work trips, we’d planned to go home for the weekend rather than work through as there was next to nothing that needed doing. So I was left stranded in Edinburgh with no plans. But having only come with hand luggage for a single week, I was short of clothes and certainly didn’t have anything I would need for a proper walk. 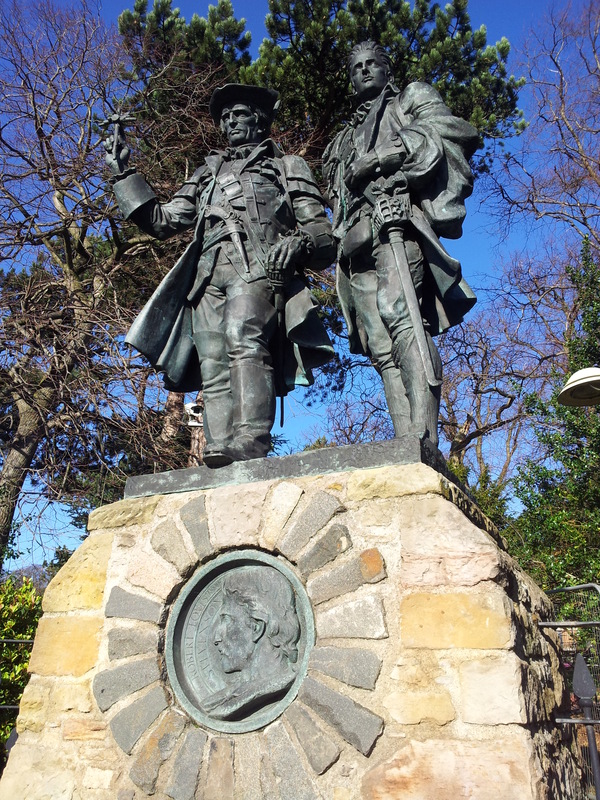 Saturday passed with an education in Scottish football at Raith Rovers, but Sunday dawned and everyone was doing their own thing, so with a decent weather forecast a walk was on the cards. Having heard of the 7 hills of Edinburgh – a 14 mile challenge run/walk, and having done one of them already (Arthur’s Seat), I thought it would be nice to collect the set, although maybe not in a single walk given the excesses of eating and drinking out every night over recent months. 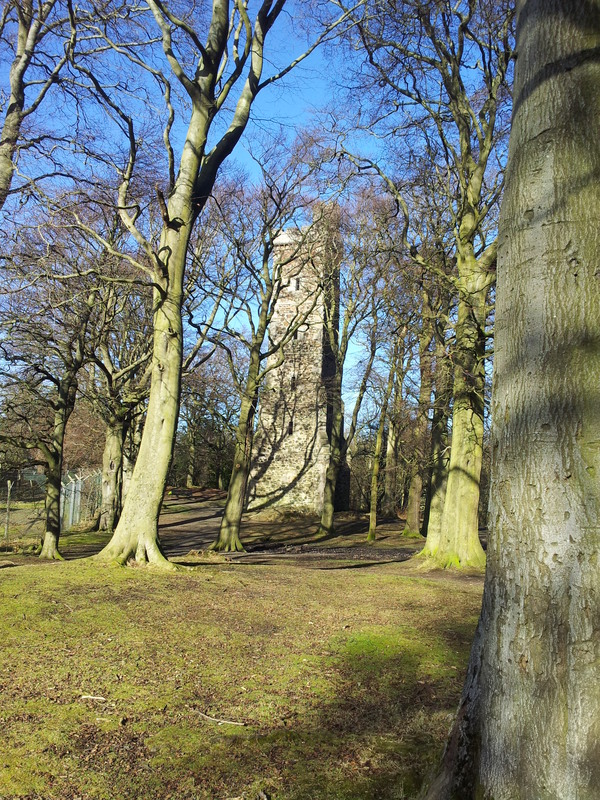 The one I really wanted to do was Corstorphine Hill which I’d passed in the taxi to/from the airport each time. 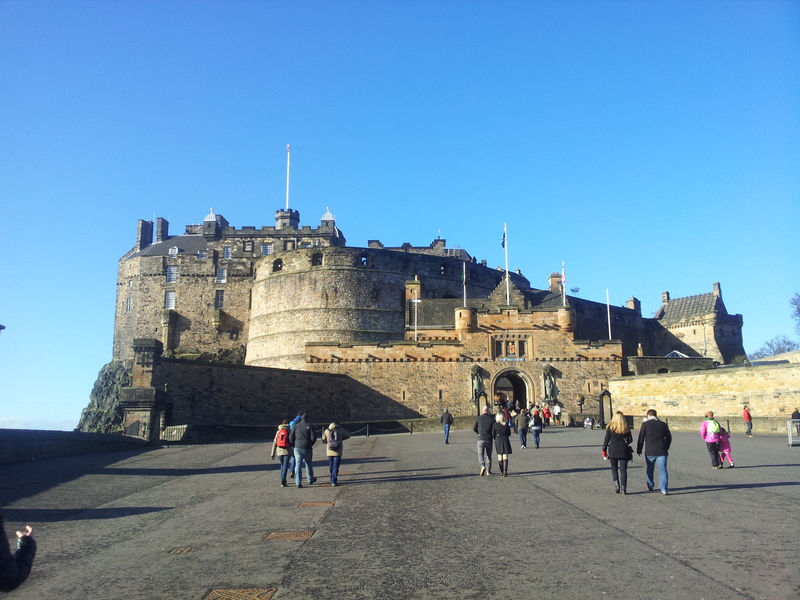 I walked around the corner and up the cobbled street to the castle, also one of the 7 hills. Two in the bag. I didn’t go in though, partly because I didn’t want to get ensnared by hordes of slow-moving tourists, but mainly because of the £16 entrance fee. So technically I didn’t quite bag the summit, but I won’t tell if you won’t. 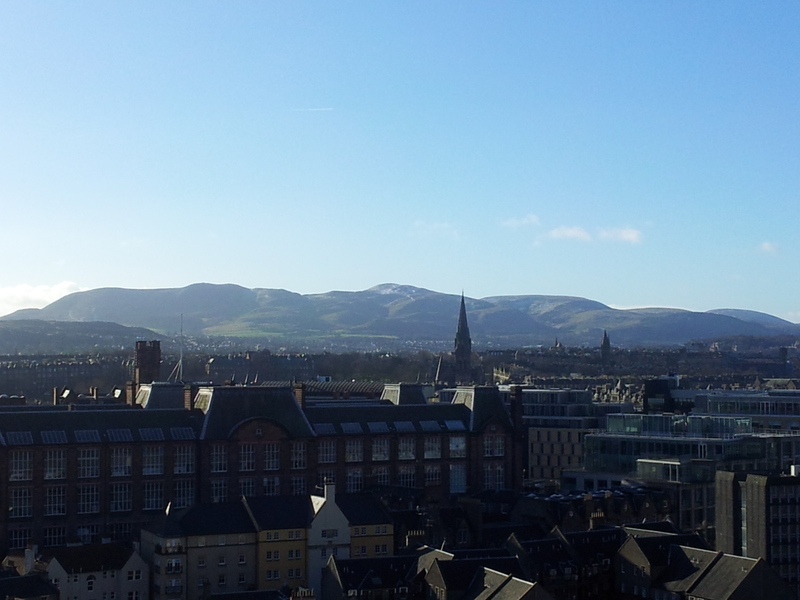 One thing I did get though was the view of the Pentlands, a topic for another day. 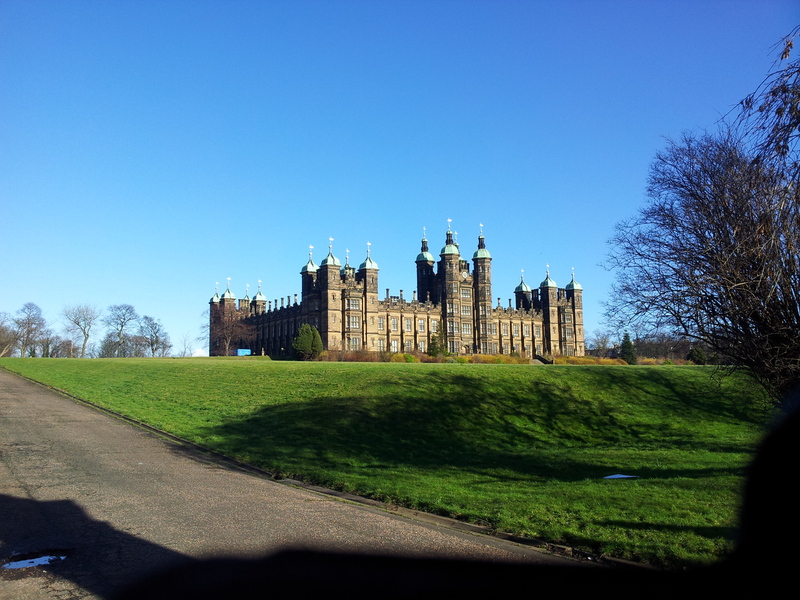 I headed down the hill and along Castle Terrace to make my way out west. A long plod through the streets ensued. I arrived at the bottom of the hill and stepped off the pavement into the wooded parkland which sloped ever upwards. Exploration of the paths through the trees brought me onto a heathery gorsey open area and an obvious route upwards. 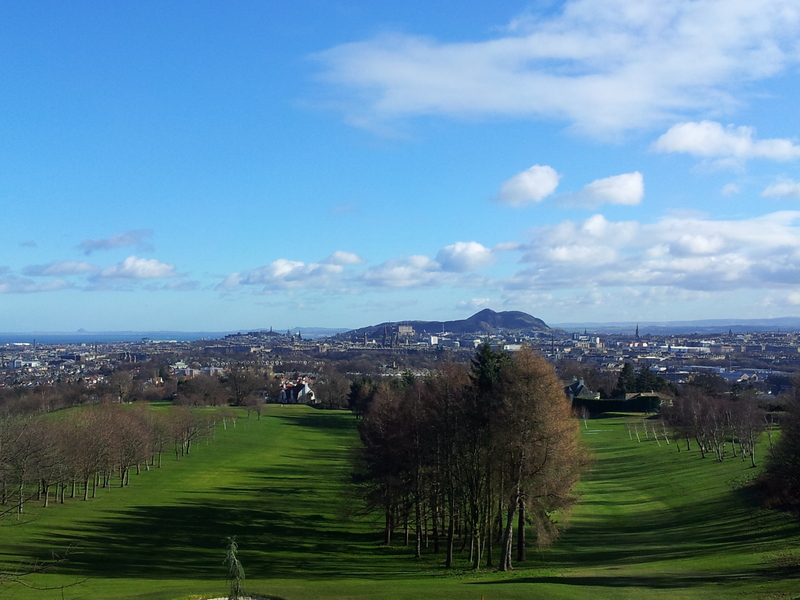 Now on the east edge of the hill, I looked down over the golf course back to central Edinburgh, Arthur’s Seat standing imposingly in the background. A fence channeled me along and round to the right of the zoo grounds. A mast the other side of the fence appeared to denote a hilltop so I clambered up and got as close as I could. A slight descent and then the ground was rising again, the top of this hill reminding me of some of the orienteering courses back home. Through the trees, I spied some stonework. I continued along the hill, through the undulating wood, seeking the real summit, which lay slightly off the main paths. Success. From a distance the hill just looks like a wood with a mast atop it. But on the ground it’s a lot more interesting, and I found myself really enjoying the day. This being so, prolonging the walk on the hill was the priority so I continued northward along the top, seeking to eke it out as long as I could. Eventually a path took me down and I walked around the bottom of the hill before stepping out into the urban and a long slog back through the suburbs.